News, Press Releases and Announcements! Download the Fiesta Media Sheet by clicking here. 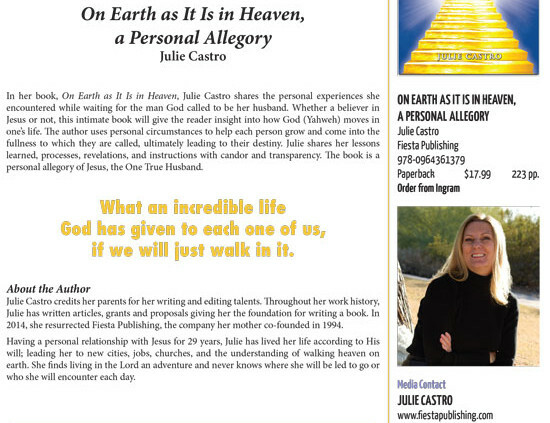 Julie Castro published her personal allegory On Earth as It Is in Heaven in 2015. It was a step of obedience in her faith walk. Doors opened up for her to minister at churches, selling a few books along the way. Click here to read more. When Julie Castro published the book she was instructed to write in January 2015, she had visions of grandeur, selling thousands of books in the first year. She thought she knew exactly what God was going to do and how He was going to do it. God had other plans. Click to read more. Fiesta Publishing is proud to present it’s first manuscript in over 15 years. Julie Castro has resurrected her mother’s company founded in 1993. Previously, the titles focused onaviation, cookbooks and travel guides. In 2015, Fiesta Publishing adds a new genre. On Earth as It Is in Heaven, a Personal Allegory, is a reality book that shares lessons learned, processes, revelations and instructions that Ms. Castro personally experienced. The reader will gain a clearer understanding of the Father, Son and Holy Spirit and how They operate in one’s life to bring each person to their destiny. Click to read more. 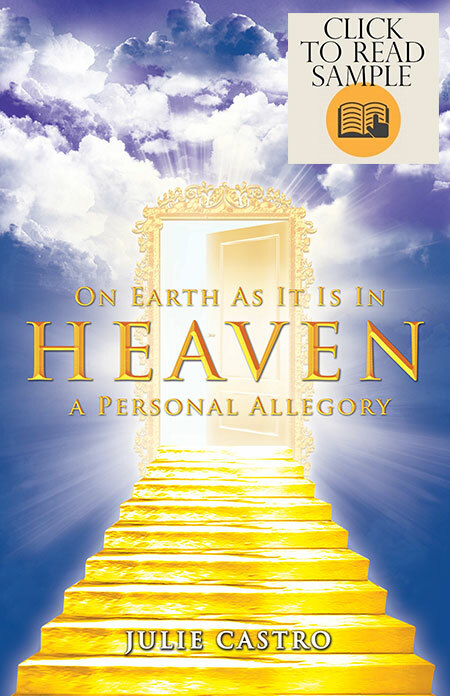 On Earth as It Is in Heaven, a Personal Allegory, is a testimony, a reality book of Julie Castro’s personal journey in which each chapter addresses a scenario; but is relevant to the bigger picture and overarching themes of Jesus and walking her path that God predestined. Ultimately, the book is a personal allegory of Jesus, the One True Husband. The lessons learned, processes, revelations and instructions are shared to readers with candor and transparency. The reader will gain a clearer understanding of the Father, Son and Holy Spirit and how They operate in one’s life to bring each person to their destiny. Click here to read more. Click Here to Read a Sample! Julie Castro resurrected Fiesta Publishing, the company her mother co-founded over 20 years ago in order to publish the book she wrote, On Earth as It Is in Heaven, a Personal Allegory. It was the catalyst for her call to ministry, a call she didn’t know existed until a few years ago. Obedience to God’s instruction to write the book opened the door for Julie to assist with the women’s ministry at her local church where she was responsible for minor tasks; this led to her current position as the women’s ministry director. Her faithfulness with the small things then opened doors to minister at local churches, pray for the Body of Christ and serve other ministries. Being unconventional in her walk with Jesus, Julie does not limit how the Lord wants to use her and the messages she shares. She passionately pursues Jesus and her relentless fire for the Holy Word of God is leading her toward her destiny. Unbeknownst to Julie, she was called to ministry at the age of seven. It would be over 40 years before she realized that God had chosen her to serve Him. Her obedience to God’s instructions to write and publish On Earth as It Is in Heaven, a Personal Allegory, was the catalyst for ministry doors to open for Ms. Castro. First, Julie was asked to assist with the women’s ministry in her local church where she was responsible for minor tasks. Following the instructions and her faithfulness with the small things led to an open door to speak the Word of God at a small congregation outside of her local church. Not knowing what the future held, Julie continued to be a light to those she encountered in her daily life. 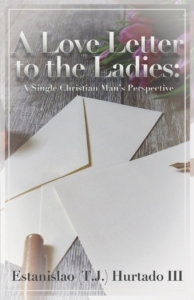 The next door opened 9 months after publishing the book, when she was asked to serve as the director of the women’s ministry. At the same time, a door opened to minister in the Dominican Republic. With a heart to pray, she ministered to children and adults through individual and corporate prayer. Julie’s obedience has since led to opportunities to minister at other churches, her local church, praying for the Body of Christ, as well as serve other ministries. Being unconventional in her walk with Jesus, Julie does not limit how the Lord wants to use her and the messages she shares. She passionately pursues Jesus and her relentless fire for the Holy Word of God is leading her toward her destiny. Fiesta Publishing is a company that produces books of excellence that glorify the Lord in all that it publishes. Thus, by their fruit you will recognize them. Matthew 7:20. 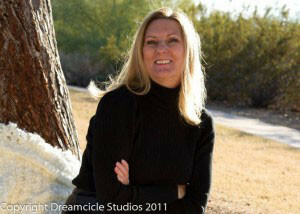 To learn more about Fiesta Publishing, visit the company website at www.fiestapublishing.com or contact Julie Castro at 602.795.5868. Fiesta Publishing is one of a small group of publishing companies that was founded over 20 years ago as a self-publishing company before self-publishing became popular. Unlike many self-publishing companies that are in the business for the money, Fiesta Publishing has and always will be a publisher of excellence and is selective about the books it publishes. Co-founded by Sue Myal, Julie Castro’s mother, Fiesta Publishing published 7 books before going on hiatus for over 15 years. Julie’s dad was founder, publisher and editor of a technical aviation magazine that is still in existence today. 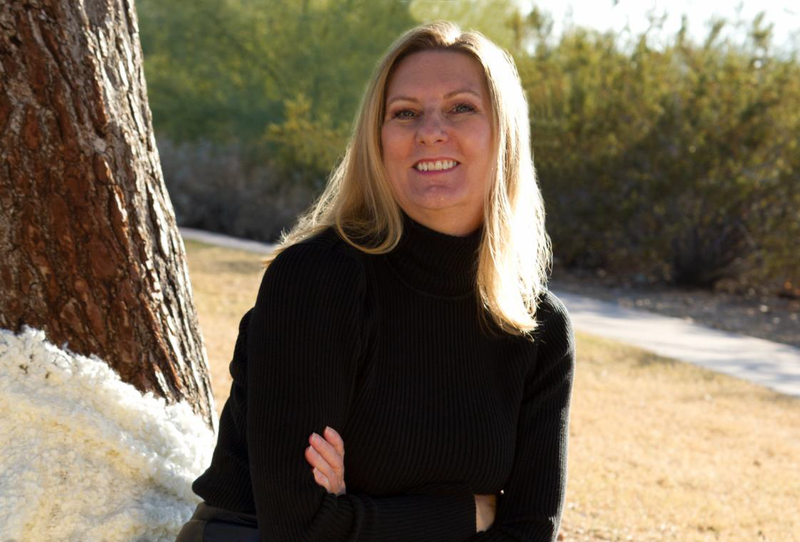 It was inevitable she would write, resurrect her mother’s company and publish hew own book, as she assisted both her parents with editing, transcription, and even the fun of eating Mexican food while researching her mother’s book, Tucson’s Mexican Restaurants. Besides the business aspect of publishing, Julie began to develop her writing skills early in her career by writing a job description for a position that she identified was needed in the company where she worked. The position was also created for her. Grant writing became a talent, as she was awarded several grants while she serving as director of a completely grant-funded community outreach program. Julie’s writing skills continued to develop as she was responsible for all workforce related proposals and documents for several of the Governor’s advisory councils and commissions. An article she wrote for the National Council of University Research Administrators (NCURA) was published in the March/April 2013 magazine. The book publishing industry has changed since Fiesta Publishing started in 1994, but the standard and quality of each book published has not. Each book is personally overseen by Julie to ensure that it is personalized to the content, its author and ultimately the reader. To learn more about Fiesta Publishing, visit the company website at www.fiestapublishing.com or contact Julie Castro at 602.795.5868.